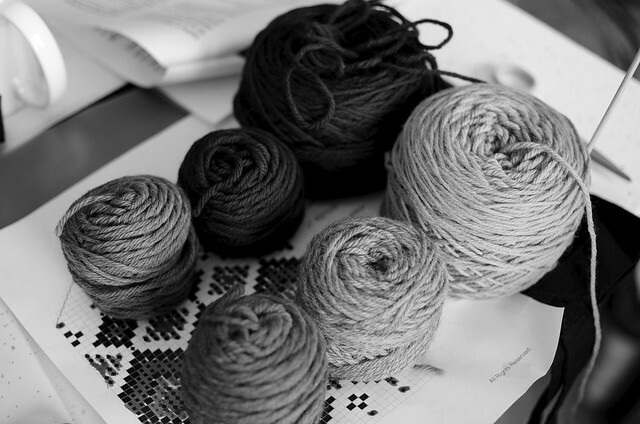 It’s easy to grab a bunch of yarn with colors that sing to you, but when you’re doing colorwork, particularly colorwork with fine lines, small stitches, or many colors, knowing the value (relative lightness or darkness of a color) is important, too. 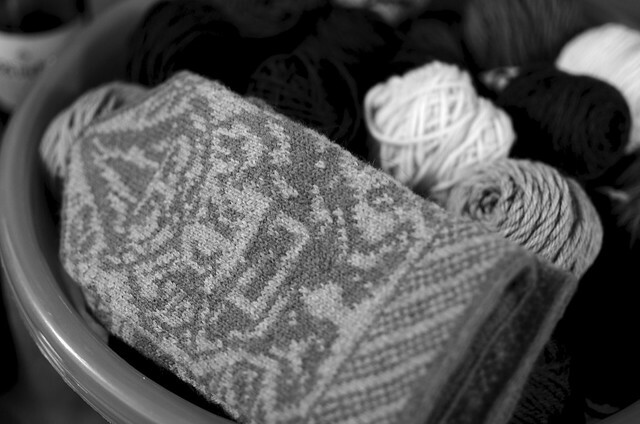 Taking a black and white photo is a great way of finding out the values of the yarns you’re thinking of using. The person who chose the yarns below is good to go. She’ll be able to create a wide variety of color combinations in her mittens that will contrast both in color, which she can tell by eye, and value, which is seen in this photo. I think this photo trick is great because you might be surprised by what colors have really similar values. The reason you can see a gnome in this mitten, with its million sts. per inch, is because Cheryl used colors with different values. See? 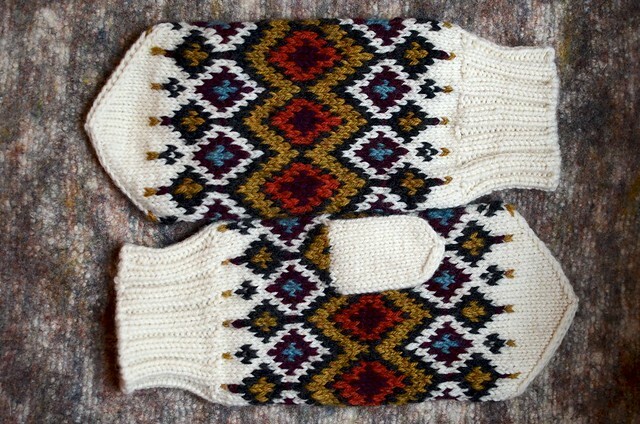 For the Hickory Mittens, I definitely like a lot of contrast between the values of the main color and the second main color (the motif outliner). As for the contrast colors, there are some different, wonderful, options. Would you ever guess that the blue, gold, and orange were so similar in value? I think they’re all great combinations. 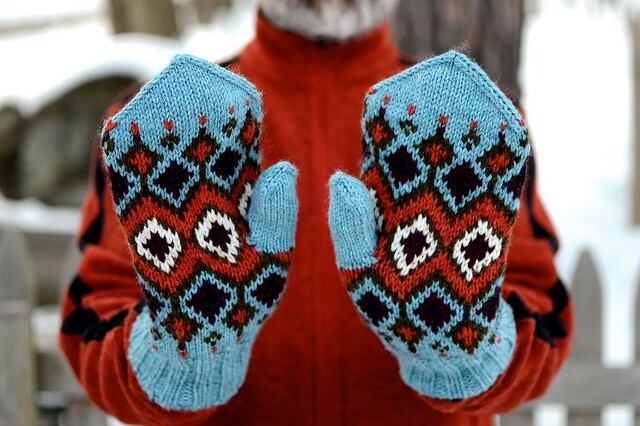 Take note that there are differences in values in each pair, just that you don’t need to have a certain number of each to make awesome mittens. I know that people at Mitten School had iPhone apps that took b&w photos, but I can’t remember the names. The new Flickr app has a filter that works well. Very handy for in-store comparisons. For these photos, I turned my DSLR to B&W and just looked at the screen. Works a treat! I designed a new mitten! 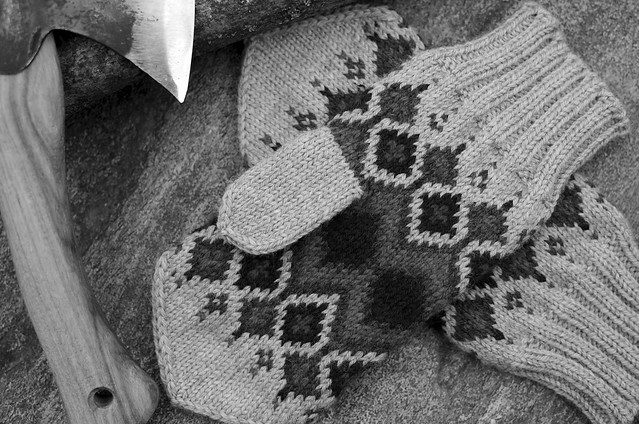 Gauge: 28 (26, 24) stitches and 28 (26, 24) rows = 4” [10cm] in colorwork pattern. Finished mitten size is determined by gauge/needle. I used Cascade 220 for these because it’s a fantastic sturdy yarn for mittens and because chances are, you have some of it laying around. The motif outlining only requires 50 yards and all the contrast colors less than 40 yards, so chances are, you can find the yarn in your stash or you’d only need to buy the main color skein. 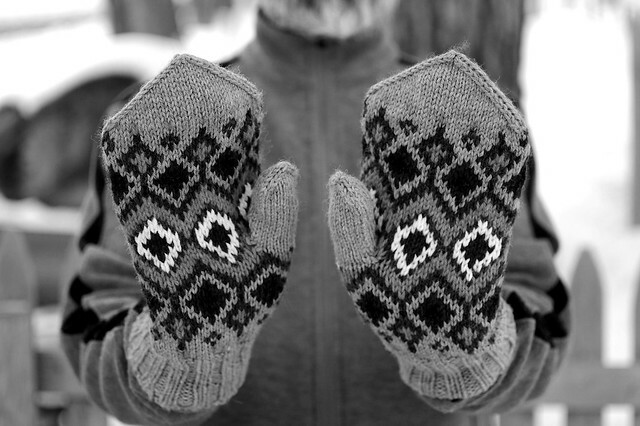 The chart for these mittens is in black and white, using symbols for the colors, which means that if you have a set of markers or colored pencils, you can have a grand old time coloring in the chart and testing color combinations. It’s a little bit of a challenge, and a whole lot of fun. 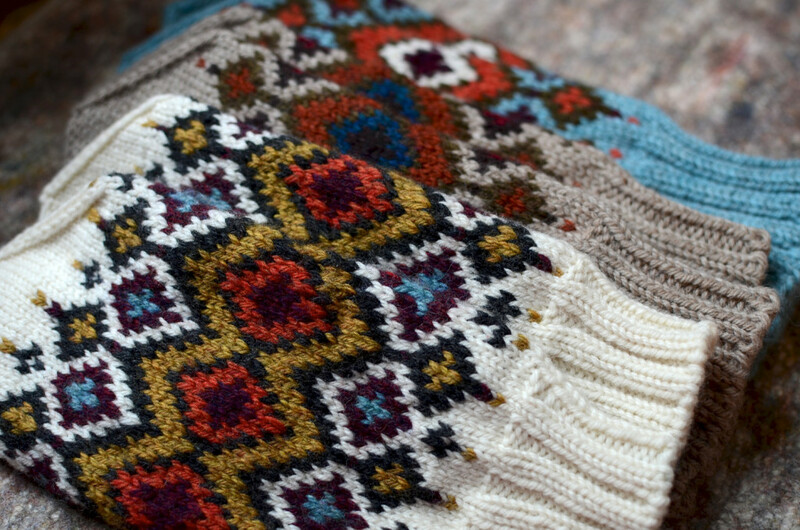 There are up to four colors per round, which means they’re not a good first colorwork pattern. That said, if you can strand two colors, you can do four. It just requires a little organization of balls or butterflies (check out this video) of yarn. Take special care to make nice loose floats and you’re good to go. For once, there’s no lining! 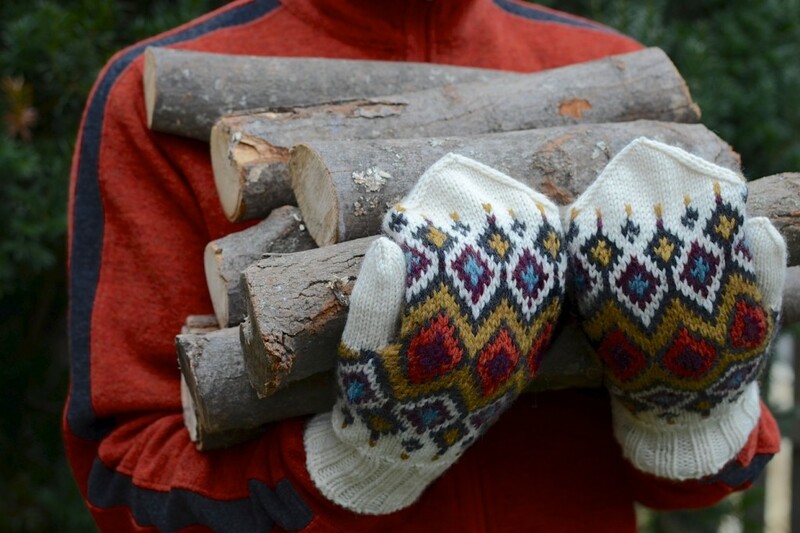 These mittens don’t need it. They’re plenty puffy and warm with all the stranding that’s going on inside. Thanks, everyone! Let me know if you have any questions that aren’t addressed on the info page.